[New for 2018] There are three new truffle flavors in the Ben & Jerry's lineup this year, and about a week after finding the caramel cheesecake version, I found the one I truly wanted to try first. 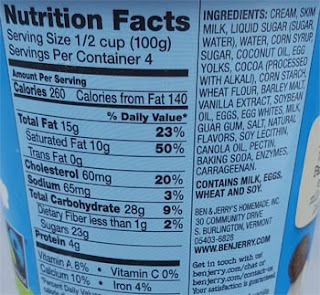 Whoa B&J, that is a great base. I forgot how much I like a good malt chocolate base but having it reminds me of the excellent three twins chocolate malt flavor. It's real good, it just needs something to play against to really bring it all the way home. And there's that gooey marshmallow swirl we love so much. You've had it before and it's just as tasty here. Like the base, it just needs something to compliment it and make this pint awesome. Hey! I found a truffle! and, oh, wait, no, that's not right. why would you put in such an uncomplimetary chocolate covered cookie thing? I'm so confused! This flavor had the finish line in its sites, it was an easy win, and it fell flat on its face. They could have put in a ton of their new smaller fudge flakes and I would have been tempted to eat the whole pint. Now this flavor isn't a total loss, it's still very good and I'm going to be thinking about it for the rest of the day, but I was stunned at how the huge truffle hit me the wrong way. Huge truffles should be a good thing. I tried another and got the same reaction. I'll still happily finish the pint, but I'll be tempted to leave the truffles until the end. On Second Scoop: the funny thing about a flavor like this is that there is a certain question in your mind on the first few bites of the second scooping. You think "was this base really as good as I thought?" but after a few bites you go "ya, it totally is". For me, there is something magical and fun about a marshmallow and chocolate malt base, so kudos to B&J for that. The truffles also didn't annoy me this time. I'm not saying I love them, but I was just more lackadaisical about it. 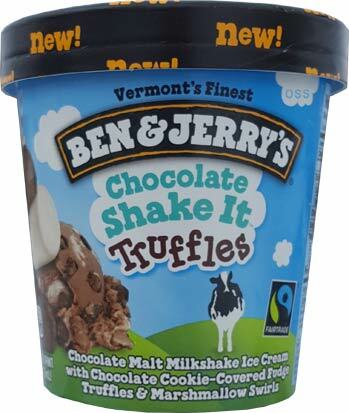 Even if you don't enjoy the truffles, I would still try this one for the base (if you love chocolate milkshakes anyway) -- actually, here's a pro tip: have several small scoops of the base until you really settle in, then mess with the truffles. That's been helping me. I felt like this flavor needed at least one more mix in to make it special. Cookie crumbs, maybe? Definitely not enough going on outside of the base. Where are people finding this one? @Latchkey: dangers of an ooey gooey swirl! I’m desperate to find the coffee truffles flavor, that was hands down the one I was most excited about. But I can’t find it to save my life. My grocery store did get in the other two, so I decided to try this one first. I did enjoy the base, could have used a touch more malt flavor for my taste. And the marshmallow was certainly fun. But the truffles, OH THE TRUFFLES! I hated them. In fact, the first one I tried, I thought something had to be wrong with them. I forced myself to eat through half of the pint hoping the truffles would magically improve. But alas. My husband, tired of hearing me complain about them still being gross, finally polished off the rest of the pint for me lol. He didn’t mind the truffles at all. Oh well, can’t love them all. I did try the cheesecake one next. A vast improvement. 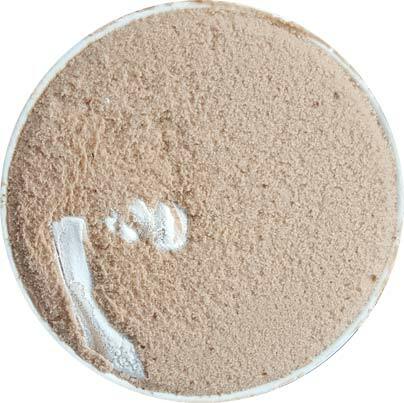 Still, like you said, the chocolate malt base was great! With a different mix-in, it could have been a winning flavor. But the truffles just ruined it for me. As excited as I was for this flavor, it ultimately will not be a repurchase for me, and like others here are saying, it's all because of those truffles. They don't taste bad or anything, but when I heard "cookie truffles" I thought they were going to be balls of the core filling from "Boom Chocolatta" or made out of the cookies from "Chocolate Therapy". But they're just generic wads of soft chocolate that don't offer any depth or contrast and taste nothing like "cookie" anything. The great thing about that is that it will last me a long time as it's not an addictive pint. But if had a slight saltiness from actual chocolate cookies, the flavor would be superior. Dear God... did anyone else here try the Gimme S’mores and hate it as much as I did? The base tasted like coffee creamer and the cookie swirl was too much. I really want to try this. I don't know if this is true, but I heard that the base ice cream tastes like a Wendy's Frosty. People really have such different ideas of what constitutes a good flavor. Reading this review and the B&J NY Super Fudge Chunk review back-to-back really solidified that for me. Granted, that one was a Nick review, but Dubba said he agreed with it in the note at the top. I went to two different grocery stores to find NYSFC, one of my favorite grocery store pints. Couldn't find it and wound up with this malt one. I'm a guy who loves malts, but this is the kind of malt I hate: a chocolate malt made from vanilla with some chocolate syrup squirted in. It's not chocolate - it's "chocolatey". That's the best way I can describe it. Pale and anemic also come to mind. On the other hand, I love the NYSFC chocolate. It's pretty close to the kind I make at home that's just a hair lighter on the cocoa (closer to a milk chocolate). @Bethany & Anon: here I thought I would be fairly alone in not liking the truffles. @latchkey: it's on the to-do list! @jason: EXACTLY!! This is why both Nick and I hate rating systems because in the end, my tastes are most likely nothing like yours when it comes to making the finally ranking of something. I can only do my best to try and describe it in a way that helps you decide whether or not to buy it. (Hopefully you get the gist of how I think over time so that you can translate my opinion in to your personal tastes). I'm glad I managed to get across that I wasn't saying you (or Nick) were "wrong", Dubba. De gustibus non est disputandum, as they say. @stride4unit - I'd definitely say the base does NOT taste like a Frosty. I don't know what they put in Frosties to make them taste like that (at this point, I'd say it's probably a highly guarded "signature flavor" churned out in some flavor factory like Givaudan), but it's not present here. I second what Jason said about getting annoyed with peanut butter constantly being shoehorned into most new ice cream flavors. It was especially annoying with Gelato Fiasco. I would've loved to try "Doughing Me, Doughing You" then they had to ruin it with *peanut butter* cookie dough. And before anyone accuses me of being self-centered : the other 2 or 3 new GF flavors already had things for the PB fans. Why did the ONE cookie dough flavor have to also be for the PB fans? I think you'd be equally irritated if coconut kept showing up in everything new. Getting back to this "Truffles" BJ flavor, I'm actually gonna have to backpedal a bit. I initially said the truffles didn't have what I would call a "bad" taste, but I'm gonna have to take that back. They really ARE nasty. 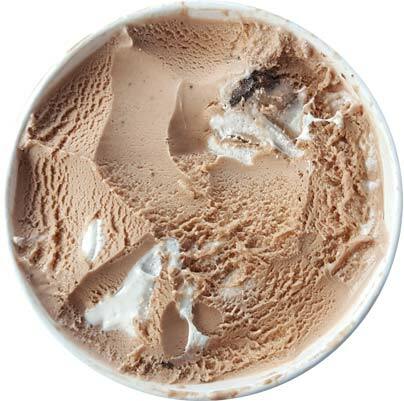 As I went deeper into my pint, the truffles were becoming impossible to avoid (with less and less marshmallow swirl) and I would inevitably get halves of them in my bites. I have "Gimme S'more" in the freezer right now...I'll try that in the next couple of days. Are you going to try the "DC Comics" ice cream flavors? They come in 48 oz cylinders like Edy's but all they have is "DC" on them. I don't think Edy's is making them. The "Batman" ice cream is "Dark Knight Brownie Bite" which is chocolate ice cream with brownie chunks. The "Wonderwoman" ice cream is "Golden Lasso" which is a mix of caramel & vanilla ice creams with golden caramel stars as mix-ins and graham cracker swirls. The "Superman" ice cream is "Kryptonite Cookie Dough" which is a cookie dough flavored ice cream, with red and yellow cookie dough chunks and blue sprinkles. I'm most interested in that last one but since you really love graham swirls in ice cream I'm curious about your thoughts on "Golden Lasso". They are all "light" ice cream, but it's still ice cream. Bruh, I tried "Gimme S'more" and absolutely love it! I don't get "coffee creamer" from the base but I don't drink coffee so what do I know? I get more of a burnt sugar flavor, and well that's what toasted marshmallows pretty much are. As much as FDD gets bashed, I think Nestle's Smores drumsticks nailed that flavor better than anything else on the market. I agree the truffles are the main issue with this entire line, which is a shame because this and the cold brew base are both really good. Side note - which program/tool do you use to edit out the background shots on your pint pics? @Sean: ok, that's random but the answer is: Photoshop! It's not really a cost effective solution, but my job bought me a license back in 2003/2004 and I still use it all these years later. Gotta love that magnetic lasso cropping tool. You can try gimp because it's free, but I prefer photoshop. In a pinch, I will use paint.net found at https://www.getpaint.net/ It's good for the top down circular shots and quick crops. Kroger and Wal-Mart still carries NYSFC. I live in the Southeast. If nothing else, that let's you know that the flavor hasn't been discontinued, and I doubt it ever would be. I think it's been around for a very long time. It would be like them discontinuing Phish Food. Thanks! I managed to get a pint of NYSFC at the Hy-Vee a few days ago (I'm in Minnesota). Oddly enough, I've never liked Phish Food. Which is weird, because I should like all the individual ingredients in it. But just something about them altogether just never clicks with me. I tried B&J Glamfire Trail Mix (pretty good apart from the pretzels, but I don't like pretzels so no shock there) and Gimme S'mores (also decent, but the graham cracker swirls were gritty and weird and would have been better as just cracker chunks - if they could have made them hold up). The grittiness is part of what made the flavor though!